My friend and fellow party industry colleague( she is also a lawyer gone party wild) wrote a wonderful article for the color story of PINK for her blog. I took an excerpt out for you to enjoy. Check it out. For the centerpiece, Beautiful Blooms filled apothecary jars with layers of rose petals, hydrangea petals, light pink cut glass, white sand, dried ivory roses and pearls. They also filed glass vases with swirled pearls and floating candles. 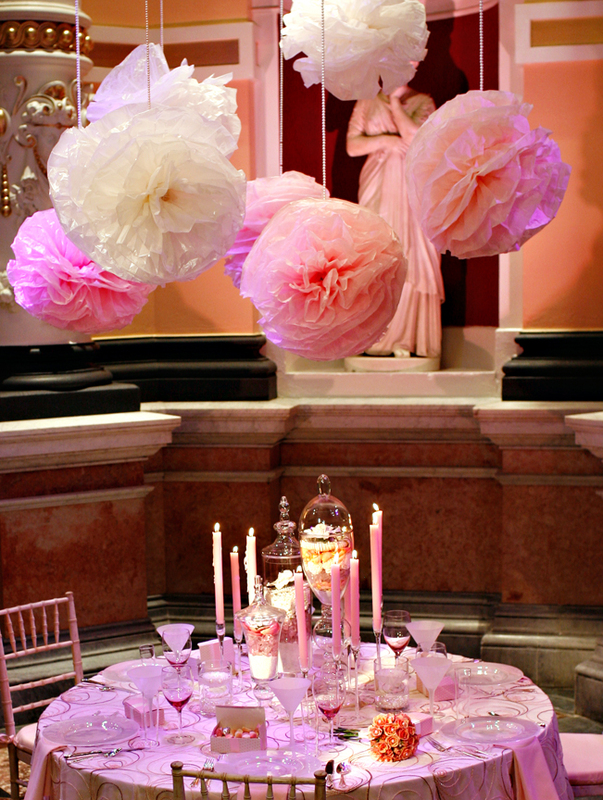 Light pink tapers in footed candleholders completed the centerpieces perfectly. 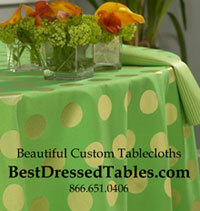 The gorgeous linens came from our friends at The Total Table. ( Yes that’s me!) The darling favor boxes were created by our favorite geniuses at Two Paper Dolls. 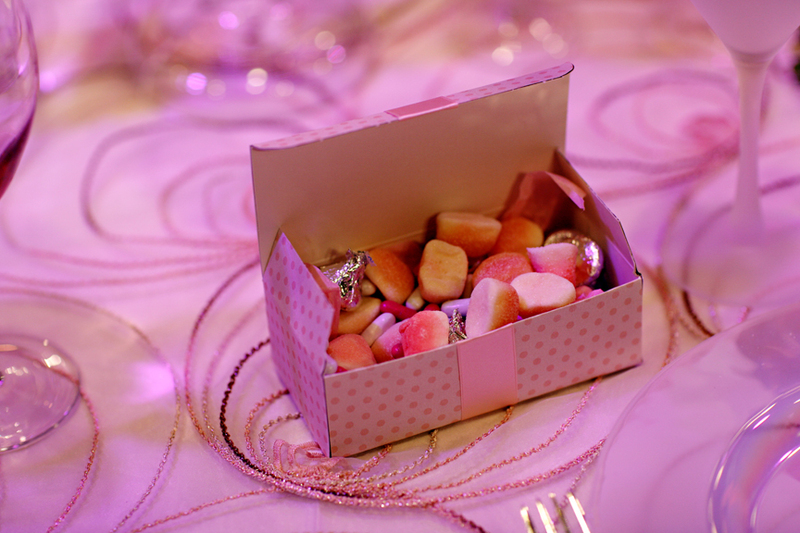 We filled them with a mix of Good & Plenty, Hershey’s Kisses and a variety of pink and ivory candies from The Lil’ Candy Shoppe in Northern Liberties. Max and Me Catering did a fantastic job of of coming up with food and drink that was coordinated perfectly with the décor. Just look at those irresistible cosmos and glasses of pink champagne and wonderful white wine. They also created a beautiful entrée of Diver Scallops with a Celery Root Puree and Citrus Beurre Blanc. Our kudos to David Robison, Max and Me’s Executive Chef and Theresa Linskey, the Sous Chef. The Girls Only Party was not only gorgeous, it was also incredibly yummy! It makes me want to have a party – how about you? It just all looks so scrumptous. So pick your favorite color and coordinate everything around that color. It really makes an impact when you stick with one color.